Regular Graph Paper. 10/12 Graph Paper  - $6.00 : Yarn Tree, Your wholesale source for cross stitch supplies. Item 2521. 10/12 Graph Paper. Pad of 24 sheets--12 Sheets of 10 Count Paper and 12 Sheets of 12 Count Paper. 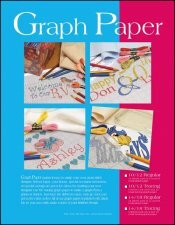 Graph Paper makes it easy to make your cross stitch designs. School logos, special occasion mementos, your home, or special sayings are just a few ideas for charting your own! Use the tracing graph paper to make a graph from a photo or sketch. Just trace the different colors; then go back and put in the color codes! All of our graph paper is printed with black ink so you can easily make copies of your finished design. 8½”x11” pads.